Trying to wrap your head around the fast-breaking events in Egypt? Unsure as to whether this is a triumph for liberal democracy or a dark new chapter in the spread of militant Islam? You could do worse than turning to two of the most sagacious pundits in the land, David Warren and Andy McCarthy (the latter a former federal prosecutor who handled several cases relating to Islamic terrorism). While I recognize that support for “democracy and freedom” is substantial, within each Arab national society — that the middle class is not a nothing; that each economy depends on it — I doubt this “faction” can prevail. Worse, I think we are watching its final, hopeless bid for power. The key fact, in Egypt (paralleled in Yemen and elsewhere), is that the Muslim Brotherhood has not declared itself. The Islamists could put vastly more people on the street. They could subvert the loyalties of policemen and soldiers, who already resent the moneyed middle class. They could generate just enough heat to make large districts of Cairo and Alexandria, now simmering, boil over. But instead, they are playing neutral, watching those policemen and soldiers put the demonstrators down, while most of Egypt remains quiescent. For this is not their revolution, and for the moment they are content to watch the autocratic regime, and its frustrated middle class, weaken each other. Their moment will come when Mubarak totters. History is rarely a Manichean contest between good and evil. It’s not a choice between the pro-Western shah and Iranian freedom, but between the shah and Khomeini’s ruthless Islamist revolution. It’s not a choice between the pro-Western Musharraf and Pakistani freedom, but between Musharraf and a tense alliance of kleptocratic socialists and Islamists. Back in the 1940s, it was not a choice between the British-backed monarchy and Egyptian freedom, but between the monarchy and a conglomeration of Nasserite pan-Arab socialists, Soviet Communists, and Brotherhood Islamists. And today, the choice is not between the pro-American Mubarak and Egyptian freedom; it is a question of whether to offer tepid support to a pro-American dictator or encourage swift transition to a different kind of tyranny — one certain to be a lot worse for us, for the West at large, and for our Israeli ally: the Muslim Brotherhood tempered only, if at all, by Mohamed ElBaradei, an anti-American leftist who willfully abetted Iran’s nuclear ambitions while running the International Atomic Energy Agency. History is not a quest for freedom. This is particularly true in the Islamic ummah, where the concept of freedom is not reasoned self-determination, as in the West, but nearly the opposite: perfect submission to Allah’s representative on earth, the Islamic state. Coupled with a Western myopia that elevates democratic forms over the culture of liberty, the failure to heed this truth has, in just the past few years, put Hamas in charge of Gaza, positioned Hezbollah to topple the Lebanese government, and presented Islamists with Kosovo — an enduring sign that, where Islam is concerned, the West can be counted on to back away even from the fundamental principle that a sovereign nation’s territorial integrity is inviolable. Both pieces deserve to be read in their entirety — and both serve as chilling warnings of what may be to come. Newt versus The Wall Street Journal editorial board – the unofficial 2012 Republican campaign is off to a very lively start. Regardless of one’s views toward Mr. Gingrich as a potential candidate, the fact that the race is already lively with substantive policy debate is a healthy sign. This may be the one good use of Al Jazeera, right now the most watched, up-to-date video feed of the Egyptian situation. If drawing a word picture of the increasingly uncivil unrest in the Middle East – and especially Egypt – the image would be dominated by the words “democracy,” “protest,” “youth,” and “change,” among others. If the on-the-ground reporting and television pictures are to be believed, the one word uniting these themes is “hope.” Specifically, hope in an end to corrupt government that robs people of wealth and ambition, as well as freedom and justice. Writers of all stripes are focusing on the importance of President Barak Obama’s administration to ‘get it right’ on its position towards the protests in Egypt, Tunisia, Yemen, Algeria, Lebanon, and Jordan. To date, Obama’s only foreign policy precedent in this realm is the lack of solidarity he showed towards pro-reform forces in Iran. Could this week’s much wider conflagration see the implosion of Obama’s claim to be the worldwide symbol of change-hope-youth-democracy-uplift? The complicating factor in all this is an American strategic interest that supports secular dictators over Islamist radicals. Continuing that choice makes sense if those are the only options, but the remarkable thing about the protests is that Islamist groups (like Egypt’s Muslim Brotherhood) are not (yet) at the forefront of the movements. Right now, it seems like most people are rebelling against the type of Mafioso government that keeps vast swaths of citizens repressed. If nothing else, the knowledge and skill required at this level of foreign policy should serve as a warning to any 2012 presidential contenders (including the man likely to want a second term). In these situations, you only get one chance to make the right decision, so you’d better be prepared. And so it is that Rahm Emanuel is back on the ballot for Chicago mayor. In a not unsurprising ruling, the Illinois Supreme Court overturned an appellate court’s decision to remove Emanuel’s name since he didn’t physically reside in the city for the year prior to next month’s election. You (and everyone else reading this blog) may remember Emanuel was President Barack Obama’s White House Chief of Staff during that time. No matter. Saying that the appellate court’s commonsensical application of law to facts had “no basis in Illinois law” the state supremes ruled 7-0 in favor of judicial activism. Nowhere in the relevant statute does it mention an “intent to return” exception to the residency requirement. Never mind, though. The “people” of Chicago support Emanuel’s candidacy by over 50%, meaning he’s likely to avoid a run-off and win outright next month. In the event Emanuel does become the Second City’s next mayor, don’t be surprised if his conception of the rule of the law involves whatever interpretation serves him at the moment. After all the “people” will have gotten the leadership they deserve. Jester’s Courtroom: Where’s the Beef? According to this description of Thune’s assets, the gentleman from South Dakota brings height, geography, and conservative positions to the presidency, but little else. If the Republican establishment is looking for their party’s equivalent of Barack Obama (lanky, genial, and bereft of significant policy success), then Thune may be their man. Should Thune run, however, Republican primary voters should insist on specifics from him as a guard against electing the Republican version of Barack Obama (inexperienced, politically tone deaf, and poor legislative skills). Being a “fresh face” in politics means one doesn’t have the scars that come with surviving important political battles. America is waging a war for her soul; now isn’t the time to elect someone else president because he’s too new to appreciate the old. Here’s the ugly reality, over two years later: The Congressional Budget Office (CBO) announced this week that the 2011 budget deficit will reach a record $1.5 trillion. That follows $1.4 trillion and $1.3 trillion deficits in his first two years. The 2008 deficit, for purposes of comparison, was $455 billion. 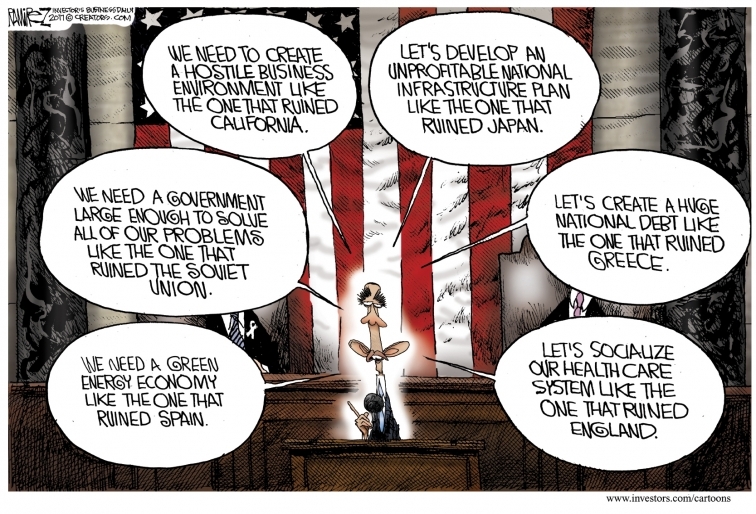 Something to consider when assessing Obama’s latest State of the Union address, and his upcoming promises over the next two years. Jonathan O. Harris, a shareholder in the Nashville (TN) office of Ogletree, Deakins, Nash, Smoak & Stewart, P.C., discusses how overly permissive pleading standards unfairly permit and encourage plaintiff abuse and the arguments contained in CFIF’s legal brief urging the Tennessee Supreme Court to adopt pleadings standards to reduce lawsuit abuse. Perhaps the Department of Health and Human Services (HHS) should get credit for making the road to serfdom a little easier to travel. Beset by criticisms that ObamaCare grants HHS Secretary Kathleen Sebelius “dictatorship” status with powers including on whom to bestow compliance waivers, HHS confirmed it handed out 500 new get-out-jail-free cards. The purpose of the year-long waivers is to provide a compliance-free bridge for employers who would otherwise opt to pay the penalty for canceling out-of-compliance insurance plans. That bridge only extends to 2014. Alex Cortes at The Daily Caller notes that the waivers (averaging about two a day so far for 729 total) will only be granted until 2014 when ObamaCare’s state-run insurance exchanges come online. Then, companies that stop offering insurance will pay the fine, but their employees will be able (i.e. forced) to use the exchanges or be fined themselves for ignoring the individual mandate. Until then, private sector employers and employees must go hat-in-hand begging for a waiver from Comrade Sebelius. Don’t worry, says a HHS spokesman, the number of waiver requests denied is “more than a handful, but not a big number.” How benevolent. Is there any promise that Barack Obama has kept as President? He certainly made plenty of them, only to break them. If the political left clings to their “Bush Lied!” belief, where are they now and what do they have to say about Barack Obama? Just curious. Liberals want Keith Olbermann to run for retiring Connecticut Sen. Joe Lieberman’s (I-Conn.) seat. The ploy to coax the former MSNBC host into the Democratic Senate primary was hatched by activists attending a conference in Pennsylvania over the weekend. Facebook and Twitter pages are already active and a website is expected to go up in the coming days. “We’re using our full set of campaign tools but they won’t go active until we get a little downtime while we’re in D.C.,” a blogger by the name of Stranded Wind wrote on the liberal website Daily Kos. Nice of Stranded Wind to get involved. Also nice of him to have a handle that will perfectly describe the Olbermann campaign the day after it goes down to defeat. CFIF VP of Legal and Public Affairs Timothy Lee yesterday appeared on The Lars Larson radio show to discuss the effort to repeal ObamaCare. Listen to the interview below. The festering “Collegegate” saga that CFIF has been following for weeks today reached front-page status in The Wall Street Journal. We’ve detailed the allegations of insider trading against career colleges, which prompted Senators Tom Coburn (R – Oklahoma) and Richard Burr (R – North Carolina) to ask whether officials within Obama’s Department of Education, “may have leaked the proposed regulations to parties supporting the Administration’s position and investors who stand to benefit from the failure of the proprietary school sector.” We also detailed how the Government Accountability Office (GAO) withdrew, then revised and republished a defective study originally released last summer involving undercover “students” sent to capture information on for-profit colleges. The GAO’s revisions all slanted in one direction – the original report inaccurately cast career colleges in an unfavorable light, while the revisions indicate that the GAO’s undercover students may have intended to entrap career college admissions personnel. According to the GAO’s own estimate, only 1 percent of reports require correction, and the statistical likelihood that all of its flaws skewed in the same direction (unfavorably toward for-profit colleges) was 1 in 65,536. Tellingly, the stock value of for-profit colleges reportedly fell 14%, or $4.2 billion, following the GAO report. Career colleges have flourished for good reason. They offer an education focusing on hands-on occupational training, and excel at serving non-traditional students who often have children, are working, are typically older and are more diverse than their peers at traditional schools. This is particularly important during the current period of job scarcity and worldwide economic competition. Unfortunately, the Obama Education Department seeks to cripple them by declaring them ineligible for federal aid. CFIF has formally petitioned House Committee on Oversight and Government Reform Chairman-Elect Darrell Issa (R – California) to investigate the Obama Education Department’s continuing campaign against for-profit colleges, and that investigation is underway. We at CFIF do not begrudge any citizen’s First Amendment right to petition the federal government for redress of grievances. It is important, however, that the new 112th Congress ensure that these troubling allegations don’t reveal impropriety within the government itself. 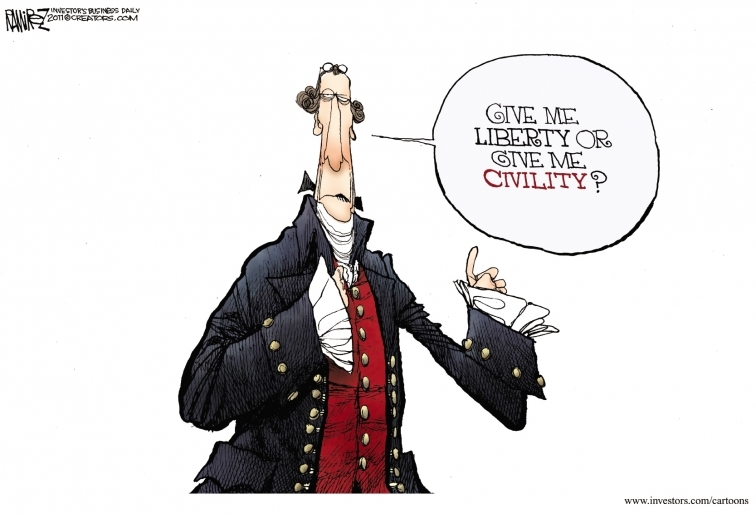 Ramirez Cartoon: Give Me Liberty or Give Me…Civility? As President Obama uses Tuesday night’s State of the Union address to attempt a pivot to the center (a topic you can hear me discuss at length with my fellow former White House speechwriters Peter Robinson and Bill McGurn in last week’s Ricochet podcast), newly minted Speaker of the House John Boehner is preparing to call the president’s bluff by teeing up an offer that the president — who has long claimed to be a proponent of education reform — shouldn’t be able to refuse: the renewal of school vouchers in Washington, D.C.
D.C. schools have long had a reputation as the nation’s worst. In response, a five year pilot program of Opportunity Scholarships (a fancy term for school vouchers) was begun in 2004. Then, in 2009 — despite years of positive results — an overwhelmingly Democratic Congress bent to the will of the teachers’ unions and shut the program down. Ninety percent of the children who had to leave the program then found themselves back in failing D.C. schools. The day after President Barack Obama makes education a centerpiece of his State of the Union address, House Speaker John Boehner will try to force his hand on the issue of school vouchers in Washington, D.C. as a test of the White House’s commitment to bipartisanship. The Ohio Republican, along with Sen. Joe Lieberman (I-Conn.), will introduce legislation on Wednesday to reauthorize the D.C. Opportunity Scholarship program, the speaker’s office said Monday, making a school voucher initiative that Democrats, including Obama, have strongly opposed as a bargaining chip for beginning discussions on the administration’s desired education proposals. It’s likely that the media won’t say much — or at least won’t say it for long — if this proposal doesn’t go anywhere. That’s to their shame. How the Democratic Party can ever expect to be taken seriously in its self-appointed role as defender of the downtrodden is inexplicable if they don’t take action to heal the wounds of poor minority children whose first, best chance at a better life is crushed beneath the weight of government bureaucracy. Three cheers for textualism rang out when an Illinois state appellate court ruled former Obama White House Chief of Staff Rahm Emanuel ineligible to run for mayor of Chicago. CFIF previously highlighted Emanuel’s dubious residency claims. Then, it was obvious Emanuel did not meet the 1 year Chicago residency requirement because he had been living in Washington, D.C.
Tellingly, no one disputes this now. Instead, Emanuel’s defenders (including the Chicago Board of Elections) support the theory that a candidate’s intent to return should be read-in (i.e. judicially legislated) as an exception to the residency requirement. The state appeals court had none of it. In a straightforward opinion, a 2-1 majority ruled for textual integrity and struck Emanuel’s name from the ballot. Of course, he’s appealing it to the state supreme court, but that shouldn’t deter that body from applying the same plain meaning of the statute to his situation. No one is saying that Rahm Emanuel can never run for mayor of Chicago, just that he must comply with the legal standards for assuming the office. If that’s too much to ask of Rahm, then maybe it would be too much to expect a faithful application of other laws once he’s in office. Please share your comments, thoughts and questions at (850) 623-1330, or listen via the Internet by clicking here. You won’t want to miss it today!